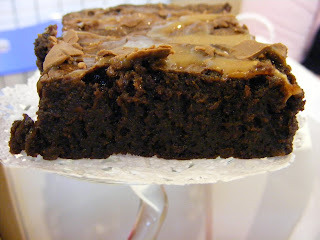 The bakers have been busy for the past couple of weeks fulfilling orders and coming up with new Lux desserts and therefore we haven't been able to make it to any of the fleas. 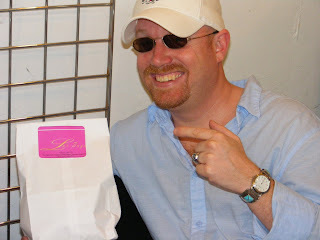 But you can check the calendar often on our main site http://www.lux-sugar.com/ to see all updates as to where we will be. 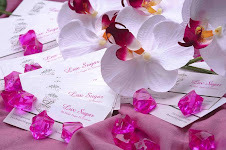 Also we are now on twitter so make sure you check us out on there to see what we're doing day by day, hour by hour, min by min :-) http://twitter.com/luxsugar. 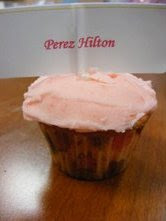 Here are a few cupcake pics to keep you happy!! We love to see our cupcakes out and about on the net so we thought we would do a mini-compilation (yes we made that word up) of sites with pix of our cupcakes being enjoyed or about to be enjoyed and bring back some oldies but goodies of our customers eating our cupcakes. 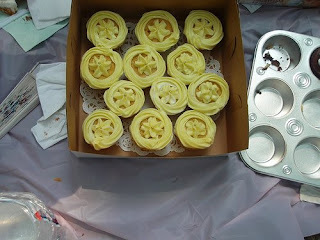 (Courtesty of Nichelle from Cupcake Takes the Cake blog)- Thats a mini Marilyn she is holding on the left. 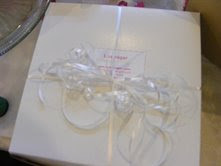 Well as a lot of our repeaters noticed Lux Sugar did not flea (as in flea market) at all this weekend and that was because the bakers were locked in the kitchen cranking out special orders. The weather this weekend was beautifully mild and many bbq's and dinner parties were planned and our customers decided to leave the baking to Lux Sugar and just enjoy themselves. 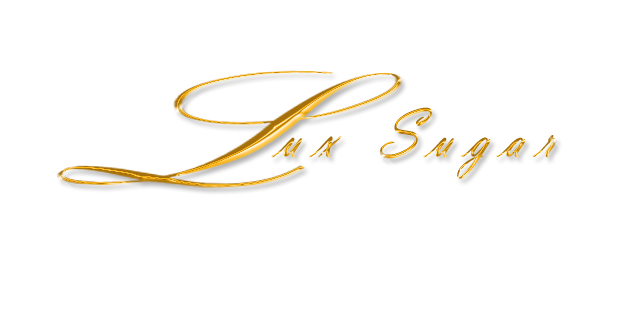 Stay tuned to see where Lux Sugar will be this weekend. 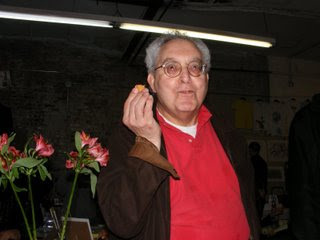 We love to see our customers eating our cupcakes and enjoying it!! 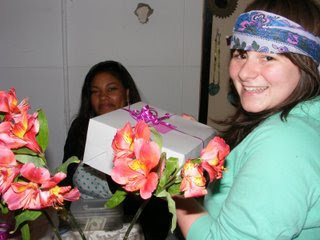 Here's a cool pic from our Etsy friend Fading Flowers (http://www.fadingflowers.etsy.com/). 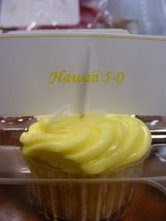 Its her daughter eating our diddy cupcake! 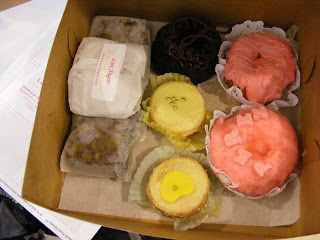 Here's a pic of us last week with Rachael from "Cupcakes Take the Cake" http://cupcakestakethecake.blogspot.com/. Rachael came out to Artists & Fleas to film a video interview with LuxSugar. We will post that as soon as its up. Thanks again to Rachael for taking the time out of her busy schedule to come by & see us. Happy Father's Day to all the great Dad's out there!! We were so busy shipping out a lot of Father's Day "LuxSugar loves Dad" packages this week (see pictures below) and therefore didn't make it out to the Fleas this weekend. But Lux-ies don't fear, we will be out and about next weekend so check the website calendar to see where we will be. 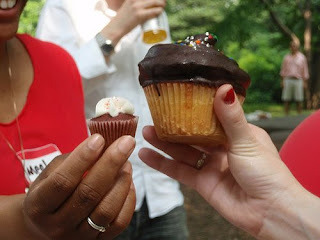 We also had a terrific time at the "Cupcakes take the Cake 2nd Annual Picnic" in Central Park yesterday. It was great hanging out with Rachael and Nichelle from "Cupcakes take the Cake" and all the great cupcake bakers and cupcake eaters. We will be back at the fleas next weekend but in the meantime we will leave you with some great pics to hold you over till we see you!! 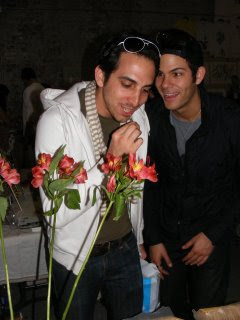 It was absolutely fantastic seeing everyone over the weekend both at A& F and BK Flea. We had a great time hanging with the NewNew team on Sunday. We wanted to thank everyone for coming out in the sweltering heat to hang out with us. 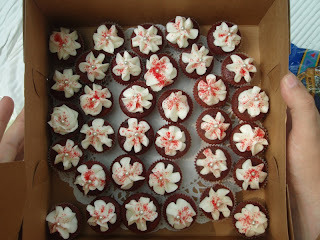 We wanted to send a special "THANK YOU" to Rachael over at "Cupcakes takes the Cakes..."http://cupcakestakethecake.blogspot.com/" who came out to film us for the blog. Look out for that very soon. Also we wanted to thank Malwi and her film crew for filming us on Sunday at BK Flea... that was also a fun and exciting experience for the LuxSugar team. We will let you know when the BK Flea documentary will be out. 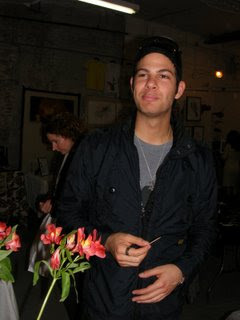 We will have pics up from both Saturday at A&F and Sunday at BK Flea shortly. We will post the pics of the cake later in the week. 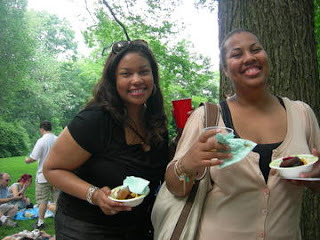 This Saturday, June 14th, come visit the bakers, Shari & Tashia at the "2nd Annual Cupcakes Takes the Cake Picnic". 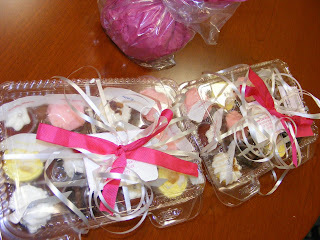 We are excited to bring our samples and meet all the other Cupcake Peops out there! We'll be there from 2p-3:30p at Central Park (Westside) near 72nd Street. See you there! 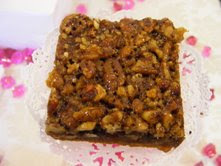 We will be at A&F in Williamsburg, BK on Saturday 6/7/08 from 11a-8p so come by and sample some of our yummy desserts. Also we'll be back at Brooklyn Flea in Fort Greene, BK on Sunday 6/8/08 from 10a-5p so put on your sunscreen and head out to see us. We sold out before 5p.m. last week so come early!! Our Love Luxsugar winner for the week is: Dana. She chose the Halle Cake and the Lux delivery team will be heading to the Bronx tomorrow night to drop off her cake. CONGRATS DANA! So its goodbye for now but we are sure we will see you all this weekend! LUXSUGAR wanted to send a special thank-you to everyone for stopping by our table at the BK Flea in Ft. Greene yesterday! It was our first time there and it was a great experience. 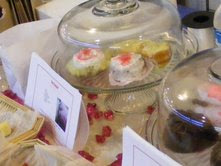 Not only did we sell out of everything (Marilyn M. red velvet, SATC Samantha lemon vodka, Perez Hilton strawberry, Orange Creamsickle, Diddy chocolate & the Lux bars) but the debut of the "Fifty-Cent Mini-Cake" was a huge HIT! We saw many of our customers from Artists & Flea in Williamsburg who came by with their coupon for "buy 2, get 1 free" and we met so many new people. We look forward to seeing our Ft. Greene customers again very very soon! In the meantime look for us in Williamsburg this Saturday at A&F as we will be filmed by our favorite blogspot "Cupcakes take the Cake". And check back later in the week to see who is our "Love Luxsugar" winner of the week & what yummy flavors we will have at A&F!